Isaly’s Chipped Chopped Ham, sliced very, very thin. 1.In a large saucepan, bring orange juice, pineapple juice, lemon zest, lemon juice, sugar, salt, pepper, red pepper flakes and cilantro to a boil. 2.Reduce heat and let glaze continue to cook at a simmer until it’s thick enough to coat the back of a spoon. 3.Remove from heat; strain and set aside. 4.In a sauté’ pan, add the citrus glaze to the Isaly’s Chipped Chopped Ham. Toss to coat. 5.Place a little bit of the glazed chipped ham onto the bottom half of an orange biscuit, top with some tropical salsa and the other half of the biscuit. 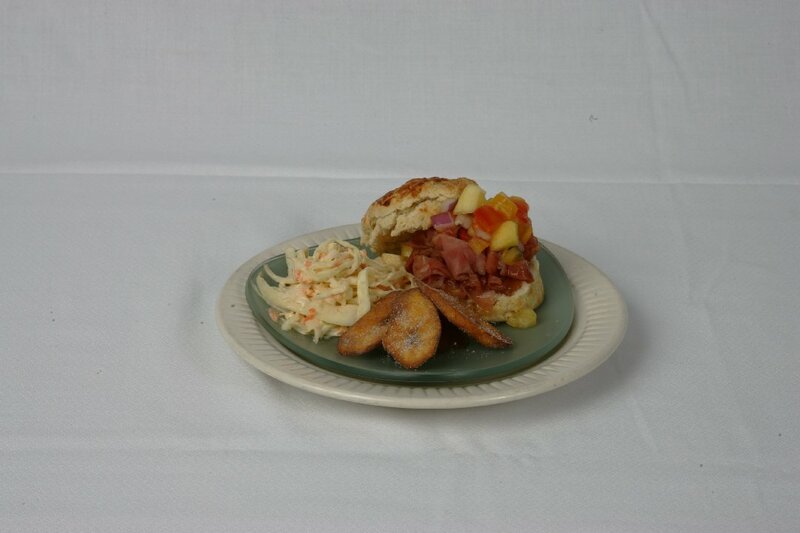 Serve with coleslaw and fried plantains. 1.Combine flour, baking powder, salt, and orange zest in bowl. 2.Cut butter into flour mixture with two knives or a pastry blender until it forms pea size pieces. 3.Add milk to flour-butter mixture. Mix just until combined, being careful not to over mix. 4.Roll out dough to 1 inch thick on floured surface. 5.Use a round cookie cutter to cut out biscuit shaped pieces. 6.Pan the biscuits side by side on parchment lined sheet tray. 7.Bake at 425 degrees for 15-20 minutes. 1.Dice the mango, pineapple, tomato, onion, and pepper. 3.Combine all fruits, vegetables, and cilantro in a bowl. 4.Add lemon juice. Add sugar, salt, and pepper according to taste. 1.Shred the cabbage and carrot. Place in a bowl. 2.Combine mayonnaise, vinegar, salt, pepper, and celery seed in another bowl. Vary these ingredients according to personal preference. 2.Cut plantain into ¼ inch slices. 4.Fry the plantains until golden brown. 5.Let drain on paper towel. 6.Season with salt and sugar.